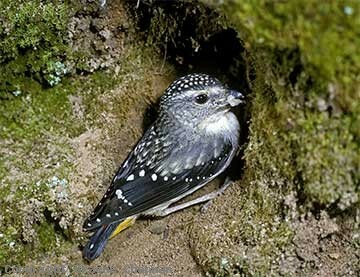 Spotted Pardalotes are only 100 mm long - one of our smallest birds. They spend nearly all of their time feeding through the foliage high up in the gum trees which makes them hard to see very clearly. They are very important for the health of the forest, effectively "vacuum cleaning" the canopies of insect pests. Only when nesting and for the occasional drink do they descend to ground level where you can appreciate their true beauty. 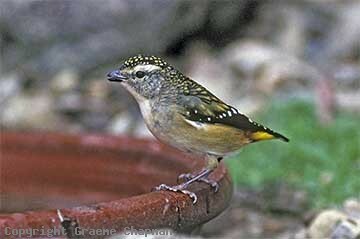 Spotted Pardalotes range widely through the eucalypt woodlands and forests of eastern and southern Australia, Tasmania and the far SW of Western Australia. When nesting, pairs maintain territories several hectares in size and tunnel into the ground to build their grass nest underground (see pic 565206). Less frequently, they utilise existing tree hollows and on occasions have been known to enter pipes and other holes in buildings. Once upon a time when we lived in Canberra we noticed a pair searching for a nest site around the foundations of our house, so we provided them with a ready-made hollow consisting on a clay pot on its side with and entrance tube of 2" PVC pipe which we buried in the ground. They accepted it readily and when the nestlings grew larger, it was great to sit above on the verandah and hear their pleading calls which were amplified by the artificial structure, rather like an organ pipe. 565201 ... 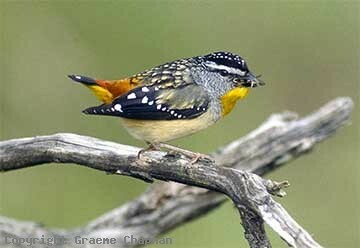 Spotted Pardalote, adult male. 565203 ... Females have yellow spots on the crown. 565204 ... 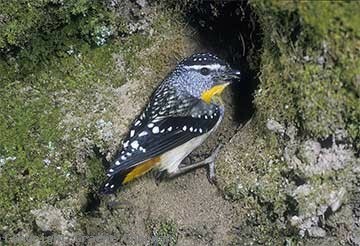 Spotted Pardalote, adult female.